Friday last an Express arrived here from Major Washington, with Advice, that Mr. Ward, Ensign of Capt. Trent’s Company, was compelled to surrender his small Fort in the Forks of Monongahela to the French, on the 17th past; who fell down from Venango with a Fleet of 360 Battoes and Canoes, upwards of 1000 Men, and 18 Pieces of Artillery, which they planted against the Fort; and Mr. Ward having but 44 Men, and no Cannon to make a proper Defence, was obliged to surrender on Summons, capitulating to march out with their Arms, &c. and they had accordingly joined Major Washington, who was advanced with three Companies of the Virginia Forces, as far as the New Store near the Allegheny Mountains, where the Men were employed in clearing a Road for the Cannon, which were every Day expected with Col. Fry, and the Remainder of the Regiment. — We hear farther, that some few of the English Traders on the Ohio escaped, but ’tis supposed the greatest Part are taken, with all their Goods, and Skins, to the Amount of near 20,000 pounds. The Indian Chiefs, however, have dispatch’d Messages to Pennsylvania, and Virginia, desiring that the English would not be discouraged, but send out their Warriors to join them, and drive the French out of the Country before they fortify; otherwise the Trade will be lost, and, to their great Grief, an eternal Separation made between the Indians and their Brethren the English. ‘Tis farther said, that besides the French that came down from Venango, another Body of near 400, is coming up the Ohio; and that 600 French Indians, of the Chippaways and Ottaways, are coming down Siota River, from the Lake, to join them; and many more French are expected from Canada; the Design being to establish themselves, settle their Indians, and build Forts just on the Back of our Settlements in all our Colonies; from which Forts, as they did from Crown-Point, they may send out their Parties to kill and scalp the Inhabitants, and ruin the Frontier Counties. Accordingly we hear, that the Back Settlers in Virginia, are so terrify’d by the Murdering and Scalping of the Family last Winter, and the Taking of this Fort, that they begin already to abandon their Plantations, and remove to Places of more Safety. — The Confidence of the French in this Undertaking seems well-grounded on the present disunited State of the British Colonies, and the extreme Difficulty of bringing so many different Governments and Assemblies to agree in any speedy and effectual Measures for our common Defence and Security; while our Enemies have the very great Advantage of being under one Direction, with one Council, and one Purse. Hence, and from the great Distance of Britain, they presume that they may with Impunity violate the most solemn Treaties subsisting between the two Crowns, kill, seize and imprison our Traders, and confiscate their Effects at Pleasure (as they have done for several Years past) murder and scalp our Farmers, with their Wives and Children, and take an easy Possession of such Parts of the British Territory as they find most convenient for them; which if they are permitted to do, must end in the Destruction of the British Interest, Trade and Plantations in America. 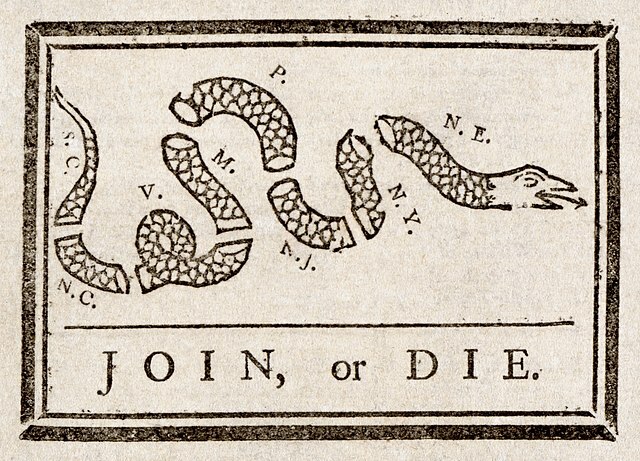 why was the join or die illustration created? I think to have the colonies come 2gether. You think? It is obviously the meaning. It was to have the colonies come together to fight against the French and Indians in 1754. In 1765 it was to fight against the British to gain freedom. I mean, like, why are you interested in this. It’s so uncool. Like, history is lame and school makes you learn it which makes it more lamer. Like, I can’t believe we have to learn about Britain of all things. Ew. Vanessa, lemme just say that you are so right!